Sugarcane juice is the opaque and viscous liquid, brownish to deep-green in colour, obtained by pressing sugarcane stalks. Sugarcane juice is mainly processed into sugar, but part of the production goes to human consumption as fresh juice or alcohol (cachaça). Juice from traditional production and surplus juice from sugar factories (when sugar prices are low) often goes to animal feeding (OECD, 2011; Myer et al., 2001). In traditional mills, the juice may be extracted using a simple crusher, draught powered, motorized or manually operated. The extraction rate is lower than at a sugar factory (40-50%). Cane juice, extracted in this way, contains approximately 10 to 13% more total sugars compared to factory juice, principally because no water is added (Pérez, 1997). Sugarcane syrup is produced by the liming, heating and concentration of sugarcane juice. This product can be used in livestock (pig) feeding (Nguyen Nhut Xuan Dung et al., 2010). Sugarcane juice is a highly digestible ingredient and a viable alternative energy source for pigs and poultry in tropical regions when sugar prices are low (Myer et al., 2001). It can also be fed to other livestock including beef cattle, dairy cows and other ruminants. The dry matter of sugarcane juice (16-20%) contains mainly sucrose and reducing sugars including glucose and fructose. Other organic components (about 17%) include protein, chlorophyll, tannins, wax and fibre (Xandé et al., 2008). Its main nutritional limitation is its neglible protein content (lower than 1% DM): one feature of feeding sugarcane juice is that practically all the protein must come from the supplement, and the amino acid balance will be that of the supplement. Sugarcane juice is very palatable to livestock due to its high sugar content (Pérez, 1997). The composition of sugarcane juice varies according to the variety, age and health of the sugarcane, to the environment, agricultural planning (maturity, harvest period, handling, transportation and storage), pests and diseases (OECD, 2011). Sugarcane juice ferments and spoils quickly, and should be used fresh. Intoxication was observed in young Zebu bulls consuming fresh sugarcane juice, and poor management of the juice was suspected (Duarte et al., 1982). Sugarcane juice can be preserved with chemicals such as sodium meta-silicate (Na2SiO3), ammonium hydroxide (1.5%), sodium benzoate (0.15%) or a 30% formaldehyde solution (1-6%) (Mena, 1988; Larrahondo et al., 1989). Formaldehyde may help preserving the juice for up to 72h (Mena, 1988). Natural sources of benzoic acid such as the macerated leaves of Salix humboldtiana or Cavendishia quereme can be used to increase shelf-life up to 96h (Larrahondo et al., 1989). Sugarcane juice has been shown to be an excellent source of energy for growing ruminants, but to ensure that maximum growth rates are achieved it is necessary to supply protein and roughage. Several trials took place in Latin America in the early 1980s. In one experiment in Mexico, beef cattle fed ad libitum a mixture of sugarcane juice (with 0.5% urea), sunflower meal and grass had much better growth rates than animals fed molasses rather than cane juice (average daily gain of 1.32 vs. 0.55 kg/d) (Sanchez et al., 1980). Gains over 1 kg/d were obtained on Zebu bulls fed sugarcane juice (treated or not with ammonia) supplemented with leucaena foliage and fish meal (Duarte et al., 1982). In the Dominican Republic, fresh grass and chopped whole sugarcane were used as roughage sources to increase juice intake for growing cattle (Gill et al., 1981b). Wheat bran and signal grass (Brachiaria decumbens) were found to be better supplements for a juice-based diet than jackbean forage (Canavalia ensiformis), and sweet potato (Hughes-Jones et al., 1981). In the Dominican Republic, substitution of grazing by chopped whole sugarcane decreased milk production in dairy crossbred cows fed molasses or cane juice, the effect being more pronounced for the cows receiving juice. Similar responses in terms of feed intake, milk yield and calf growth rate were obtained when ad libitum molasses (with 2.5% urea) was replaced by sugarcane juice (with 0.8% urea) in a restricted grazing system (Gill et al., 1981a). In Tanzania, sugarcane juice improved the quality of Guinea grass silage. Silages treated with 10% (fresh weight) of sugarcane juice were of good aroma, low pH and low ammonia nitrogen. Lactic acid dominated the organic acids produced, and the silage was more acceptable to crossbred dairy cows than untreated silage (Kavana, 2012). Sugarcane juice can partially or completely replace cereal grains in pig diets under commercial conditions, as demonstrated in a number of studies. Successful experiments and commercial applications of feeding cane juice to pigs have been reported from the Caribbean islands, Mexico, Colombia, the Philippines, Vietnam, Africa and other tropical areas (see Pérez, 1997 for a comprehensive review of those studies; Mena, 1988; Speedy et al., 1991; Sarria et al., 1990; Sarria et al., 1992; Motta et al., 1994; Paula et al., 1994). Diets including sugarcane juice must be formulated using the metabolizable or net energy systems in order to avoid excessive carcass fatness. It is necessary to include protein-rich ingredients to compensate for the low protein content of the sugarcane juice (Mena, 1987). In small-scale farming systems, tropical foliages such as ensiled cassava leaves or cocoyam leaves (Xanthosoma sagittifolium) can be used as a protein source in pigs fed sugarcane juice (Du Thanh Hang et al., 1997; Rodriguez et al., 2006). 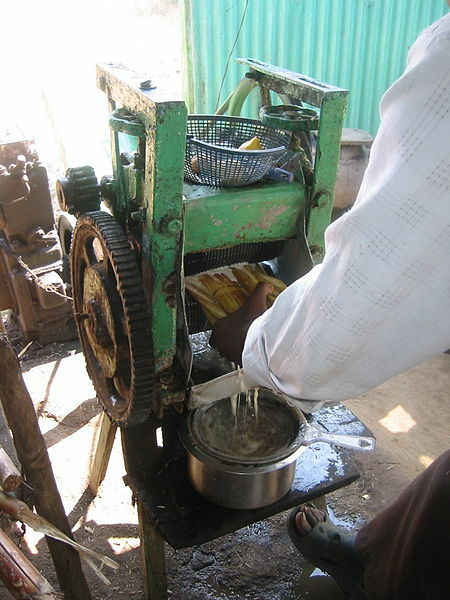 In commercial conditions, sugarcane juice can be used as the main source of energy in growing-finishing pigs and lactating sows with no limit to the inclusion rate. For example, sugarcane juice fed to finishing pigs and pregnant sows completely replaced maize grain and resulted in better animal performance, better health and a lower weaning-to-mating interval (Chaves, 2008; Paula et al., 1994). In young pigs, the inclusion level of sugarcane juice must be limited to avoid diarrhea. The principal disadvantage of feeding pigs with sugarcane juice is its high and rapid rate of fermentation (about 12 hours), which causes storage issues on the farm. The apparent energy digestibility of sugarcane juice is close to 100%, due to its high content of water soluble sugars, which are entirely digestible. The average digestible and metabolizable energy values for sugarcane juice are 17.3 and 17.1 MJ/kg DM (Xandé et al., 2010). Due to the very low DM content of the juice, and based on the ME content of sugarcane juice and maize grain, about 4.5 L of juice is required to substitute for one kg of maize (Pérez, 1997). The juice is normally fed to pigs in a drinking trough. A halved 50 cm plastic drain pipe set into cement is ideal because it can be easily and thoroughly cleaned. Ad libitum intake of juice will range from 5 litres per day at 20 kg to 15 litres per day at 100 kg live weight. A dry supplement must be fed separately, preferably in the morning in order to be totally consumed before feeding the juice (Pérez, 1997). For small-scale cane producers who raise only a few pigs, feeding sugarcane juice requires too much work to be practical. In the Philippines, some farmers preferred to partially evaporate (boil) the fresh juice, place the resultant syrup in a covered drum alongside the pig pen and reconstitute this syrup with three parts of water whenever the pigs needed to be fed. These farmers obained an average daily gain of 450 g with a diet based on sugarcane syrup and soybean meal (Pérez, 1997). Sugarcane juice can comprise up to 10-25% of poultry diets (Sonaiya et al., 2004) but higher inclusion rates have been successfully tested. In broilers, it was possible to substitute 40% of the diet with sugarcane juice by diluting the juice with water, and up to 60% by providing pure juice in a drinking trough. The birds consumed 491 g of juice and 79 g of a protein supplement (for a total DM intake of 169 g/day) and a daily weight gain of 46 g/day (from 1.1 kg to 2.1 kg) (Mena, 1988). Sugarcane juice has been used as a liquid for feeding rabbits (Bien-Aimé et al., 1989; Solarte, 1989; Nguyen Quang Suc et al., 1995). It is considered to be an energy source that can replace cereal grains. Growth rates tend to be significantly lower with sugarcane juice than with cereal grains due to a lower DM intake (Bien-Aimé et al., 1989). Sugarcane juice is almost devoid of fibre and protein, and must be appropriately supplemented to meet the feeding requirements of rabbits. However, extracting sugarcane juice for rabbits is of limited interest: juice extraction is work-intensive, the juice must be chemically treated to prevent fermentation. However, good performance is observed when rabbits are fed raw or peeled sugarcane stalks, which provide fibre together with the energy (Nguyen Quang Suc et al., 1995). Myer, R. O. ; Brendemuhl, J. H., 2001. Miscellaneous Feedstuffs. In: Swine Nutrition (eds. AJ Lewis and LL Southern), pp. 1-26, CRC Press, Boca Raton London New York Washington, D.C.
Preston, T. R. ; Leng, R. A., 1987. Matching ruminant production systems with available resources in the tropics and subtropics. Penambul Books: Armidale, N.S.W.